Do You Need Glasses or Contacts? Do you have difficulty making out the words printed on a road sign? When you try to read, are the words blurry? Have you noticed a change in your vision? If so, you may need corrective eyewear. 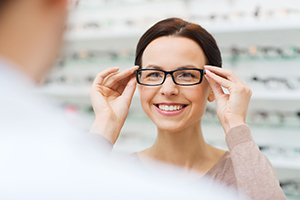 Whether you are a first time corrective eyewear candidate or already have glasses and need to update your prescription, the eye doctors at Beach Eye Medical Group can assess the clarity of your vision. When you visit Beach Eye Medical Group, we will perform a comprehensive eye exam. During the exam, we will look at the overall anatomy of the eye, as well as carry out specific vision tests. We will evaluate how the pupils respond to light; check for abnormalities in the retina; and conduct an eye chart exam (a visual acuity, or clarity, test). At Beach Eye Medical Group, our objective is to provide the right precision corrective eyewear for both children and adults in a style that suits you. In most cases, we can fill a prescription within a week. Glasses: Beach Eye offers a large selection of premium eyewear. Our collection includes the latest lines in dress, leisure, and sports eyewear, created by well-known designers scuh as Dior, Gucci and Marc Jacobs. Our over-the-counter reading glasses are both affordable and stylish. Contact Lenses: Contact lenses can be a way to improve your vision without the aid of glasses. Some people opt for contacts for aesthetic reasons, others find contacts are more accommodating for sports or other activities. If you are interested in contact lenses, our eye doctor can help you choose the best option based on the anatomy of your eye, your vision correction needs, and your lifestyle. Some possibilities include rigid gas permeable, soft, toric, bifocal, and disposable contact lenses. At Beach Eye Medical Group, our vision expert Dr. Khalil Semaan, can diagnose the nature of your vision disorder and can determine the appropriate prescription for your corrective eyewear. Contact our office today to schedule an appointment.